This is our Used Auto-Sleeper Broadway EK TB LP 2 Berth 2015/15 Plate. 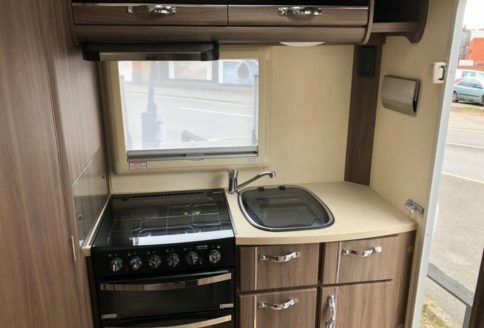 The Broadway EK, TB, LP (end kitchen, twin bench, low profile) is only 6.2 meters long and is a 2 berth coach-built Auto-Sleeper. Our Broadway EK TB LP is a medium wheel-base model and built on a Peugeot chassis. The range has been produced for about 10 years and this model is the mainstay of the Auto-Sleeper Broadway range. It is ideal for either Short breaks or extended holidays. This is yet another example that is one owner and was sold new by us. Our Broadway was registered in May 2015 and has covered just 20,000 miles. 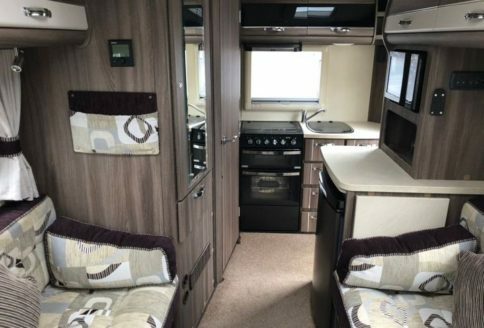 This ever-popular Broadway model has an impressive specification and as one of the later, updated models, has even more to offer. It is a 2.2 turbo diesel with 6-speed manual gear-box. The cab features air conditioning, cruise control, electric windows and a quality music system. The habitation (living space) features Auto-Sleeper’s Premium and Winter Packs, a refillable 20ltr gas tank, roof mounted solar panel, microwave oven, awning, electric water tank blankets and even a safe. Our Broadway features lots of driver and cab specification. 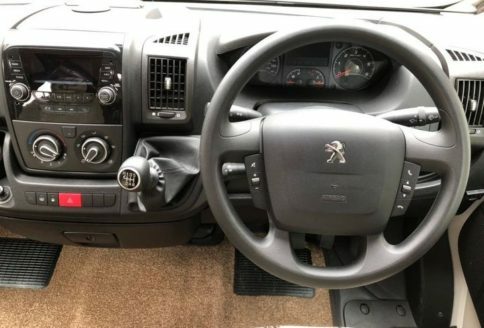 It has remote central locking, driver and passenger air-bags, electric cab windows and mirrors, an adjustable steering column, a hard-wired colour reversing camera, cruise control and steering-wheel controls for the music system too. Above the cab is a large sky-view style opening window with blind and fly-screen and the cab flooring features removeable carpets. Both cab seats will swivel around to face the lounge and have arm rests, duel height adjustment for each seat-base and finally lumbar adjustment on both too. Our Used Auto-Sleeper Broadway EK TB LP 2 Berth 2015/15 Plate has a great daily living specification. The kitchen is very good and features just about everything a chef could want. Top-of-the-list is a full-size cooker featuring 3 gas burners and 1 electric hot-plate. Below the hob is a standard sized grill and oven below that so, the Sunday roast will never be at risk! There’s also a microwave oven, a large fridge with freezer compartment and above the cooker, an electric cooker hood and storage lockers. There is ample further storage below the work-top in cupboards and drawers. 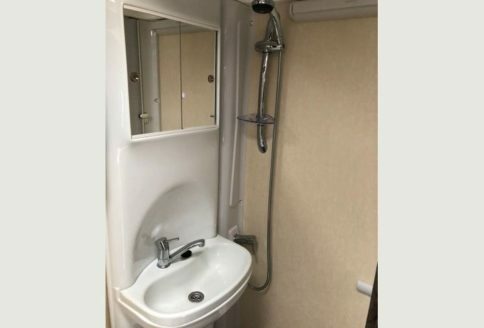 Along-side the kitchen space is the shower-room and toilet which features Auto-Sleeper’s swing-wall sink unit which opens forming a fully enclosed shower and keeping the rest of the room dry. The swing-wall sink unit also incorporates a mirrored storage cabinet and a useful storage area on the reverse for shampoo and shower gels. The toilet is a cassette style with swivelling top section for comfort and is electric flush. Our Broadway has Auto-Sleepers’ optional Premium and Winter Packs fitted featuring electric tank blankets, up-graded heating and insulation and cab blinds. Heating is by “Truma’s” 6kw combi, warm-air heating and hot water boiler system. This is powered by electric or gas and ducts warm air into the living space and shower room. Finally, the lounge, a very comfortable and spacious area where you can really put your feet up and relax. The lounge features opposing sofas, designed to sleep on as twin beds or a large double if required. During the day and early evening, with the cab seats turned around, the lounge becomes a great place to unwind or entertain. Sleeping is simple, the sofas bases slide easily on metal runners for bed make-up. 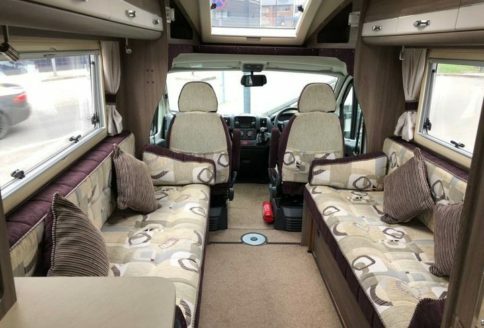 Finally, the living space is very, very light; there is a large, opening roof-light, large lounge windows and the opening Sky-View window over the low-profile cab too. While the Broadway EK TB LP is only 6.2 meters long, this doesn’t mean you end up short of storage space. As auto-Sleepers use a chassis-mounted, refillable gas tank for heating and cooking (no gas bottles here), there is lots of internal storage space underneath each lounge sofa. Each sofa base lifts and supports on gas-struts for ease of access while the passenger side also has a handy external locker-door too. On the passenger side and at lower-skirt level is a very useful wet-locker, ideal for storing leads, hoses, boots etc. While also outside can be found an external gas bbq point and power socket too. Back inside and there are lots of over-head lockers too. Finally, the last remaining features are a small pedestal table (which can be set up for use between the cab seats) as well as the standard, large, free standing table for use inside or outside. 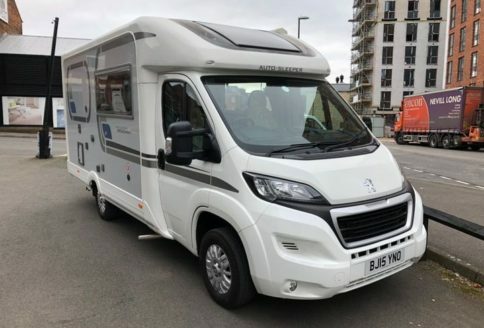 The Broadway has rear, wind-down steadies for stability when parked as well as an electric door-step and a large wind-out awning too. On the roof is an 80-watt solar panel and short-arm, directional television aerial. Come and have a look soon, we welcome part exchanges.